Cho Chikun forced the Kisei title owner, Yamashita Keigo, to resign in game 2. The score is now 1-1. You can find the game record on the tournament page. The action so far was all in the upper-right corner, where they played some variation of the very complex Magic Sword of Muramasa Joseki. Cho Chikun plays White and sealed the last move of this first day. The real fight will start tomorrow (and end tomorrow, as well). I already wrote an entry about the final. Also, a reminder that Cho Hye Yeon has a very nice English blog. She is actually the only professional player who keeps an updated blog in English – thank you for that, Hye Yeon! To point to just a few of her recent entries: there is an entry about the mirror-Go strategy, one about what is to be insei in Korea, and one about a decline in Go / Baduk popularity in Korea. 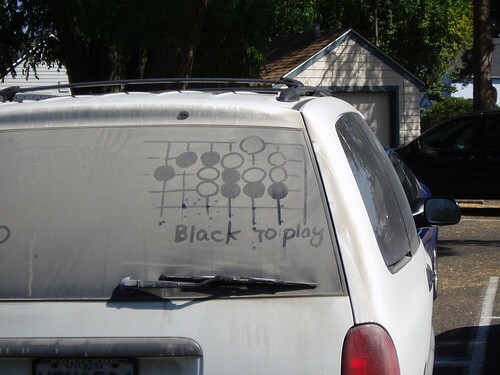 Discovered via the new random Go / Weiqi / Baduk photos page. Original link here. The game record below is from the third round which just ended: Lee Sedol won by 1.5 points, in a game in which Park Yeonghun seemed to have a slight lead when yose started. The variations are the ones I found on the Cyberoro server, where the game was broadcast live. Update: Thank you Nexik for pointing out to what looks like a variation that shows Park’s last chance to win the game, and thank you Smurf for pointing out to the fact that GoGameWorld.com has a commentary of this game by Yoo ChangHyuk in their sample section (look for “[Sample Game] 12th Samsung Cup final game 3: Park YuongHoon vs Lee Sedol.”). Jujo is watching the game analysis of the second and final game in Female Myeongin: his wife, Rui Naiwei, won by 0.5 points against the challenger Cho Hyeyeon and kept her title. 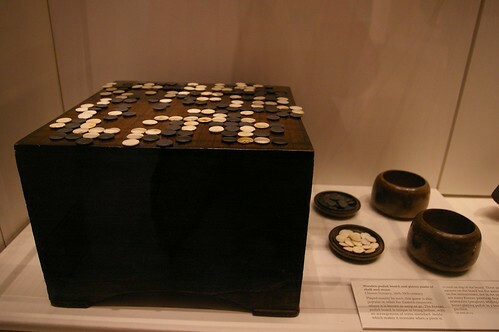 Wooden paduk board and pieces made of shell and stone Choson Dynasty, 18th-19th century Played mainly by men, this game is also popular in other Far Eastern countries, where it is known as weiqi or go. The Korean paduk board is unique in being hollow, with an arrangement of wires stretched inside which makes it resonate when a piece is moved on top of the board. There are 324 squares on the board but the game is played on the intersections, not in the spaces. There are many Korean paintings depicting Korean aristocrats (yangban) whiling away the hours playing paduk in a small summer pavilion. Here is also a link to a much larger photo version. (Here is the source of the photo). Chess genius Bobby Fischer, the first American to beat ex-Soviet Union in World Chess Championship (in early 70-ties), passed away 2 days ago. You are currently browsing the 361points.com/blog blog archives for January, 2008.